Michigan’s Hunting Access Program (HAP) provides financial incentives to landowners in southern Michigan who allow hunters access to their lands. HAP is seeking landowners who are interested in leasing their land for public hunting access. Lease rates are higher than ever and a new program in 2016 will also fund habitat improvement projects on HAP lands.BCD manages one HAP property for both Allegan and Barry Counties, which totals 97 acres. 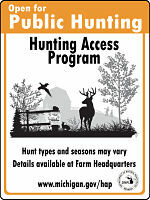 Visit http://www.michigan.gov/hap to learn more about the program and to see a current list of private lands available for hunting in Michigan. The HAP Web page includes details about enrolled properties, including types of hunting allowed and aerial photos of the properties and liability. The Michigan Department of Natural Resources will receive $951,400 to expand its Hunting Access Program into the northern Lower Peninsula to increase private-land hunting opportunities. This grant, awarded by the U.S. Department of Agriculture’s Voluntary Public Access and Habitat Incentive Program, also will improve wildlife habitats by enhancing grassland, forest and food plots. The Voluntary Public Access and Habitat Incentive Program encourages landowners to allow outdoor enthusiasts greater access to their privately owned land for hunting, bird watching, fishing and hiking. According to a 2013 study by the National Fish and Wildlife Foundation, outdoor recreation supports 6.1 million direct jobs across the country and $646 billion in spending each year. Deer hunting alone attracts more than 700,000 hunters to Michigan each year and contributes billions of dollars to the state’s economy. Michigan’s Hunting Access Program was created in 1977 to increase public hunting opportunities in southern Michigan, where 97 percent of the land base is privately owned. Through HAP, private landowners receive financial incentives for allowing hunters access to their lands. 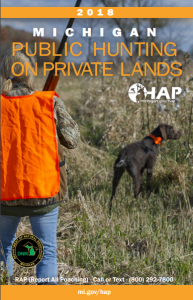 One of the oldest dedicated private-lands, public-access programs in the nation, HAP provides access to quality hunting lands near urban areas. Using funds from Michigan’s recent license restructuring, this new federal grant and an existing USDA grant, the DNR plans to continue expanding the program in the southern Lower Peninsula, the northern Lower Peninsula and the eastern Upper Peninsula over the next three years.